The No. 88 Proton Racing Porsche 911 RSR just became the first retirement from this year’s 24 Hours of Le Mans. The Porsche was hit by the No. 26 G-Drive/TDS LMP2—a car that had started the race from pole position for LMP2 and that was already in trouble for making a slightly out-of-bounds entry into pit lane. It’s a sad ending as it was entirely No. 26 driver Roman Rusinov’s fault for rear-ending the No. 88. Driver Khaled al Qubaisi tried his best to limp the No. 88 back into the pit lane, dragging one of his front wheels along in the most painful to watch way possible. Ultimately, the No. 88 car was too damaged to continue. The team put a tarp over it in the garage to signify that it was toast. Because racing is by no means fair, the No. 26 looks to be repairable. It’s back in the garage now as the team is scrambling to rebuild its front end. Crews are likewise rushing to repair the barrier hit by the Porsche as a yellow-flag stays out to keep them safe. 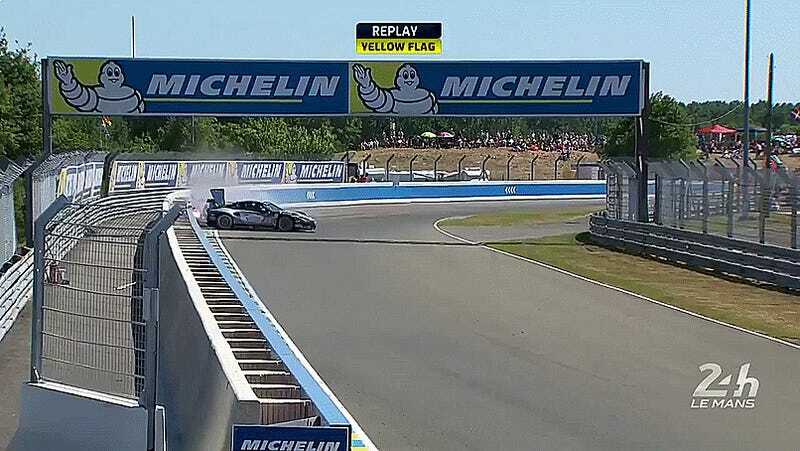 During the yellow flag, Sébastien Buemi went wide and briefly off the circuit in the No. 8 Toyota TS050, scaring us a bit and losing a bit of time, but ultimately continuing. Nico Lapierre in the No. 9 gave us a similar scare just before al Qubaisi’s crash in the No. 9, running wide into the bumpier parts of the Circuit de la Sarthe’s road section, discovering that yes, Le Mans prototypes can catch air. The No. 7 Toyota still leads overall, followed by the No. 8 Toyota. None of the manufacturer LMP1s have had any major issues so far. Meanwhile, eRacing Magazine reports that the lone privateer LMP1 in the race, the No. 4 ByKolles car, has retired. It was slowing on track due to what was believed to be a loss in compression in their Nissan V6. Given that it’s the same engine (sans hybrid) from the Nissan GT-R LM Nismo that wasn’t able to finish here, either, I don’t think that engine wants to run at Le Mans. UPDATE: The No. 26 wasn’t repairable after all and was retired shortly after this post. They were handed a three-minute stop and go penalty however, because their car was unable to continue, that penalty will be served at the next race, the 6 Hours of Nürburgring.